San Dao Courses for adults offer a program aimed at the analysis of fighting, in order to understand the most suitable systems for our physical condition: movement strategies and mechanics will be internalized to use in the contingency of necessity or danger. SHAPES: Sequences of preset movements that include fighting principles and techniques. Fundamental excercises for the perfection of a correct posture in movement. 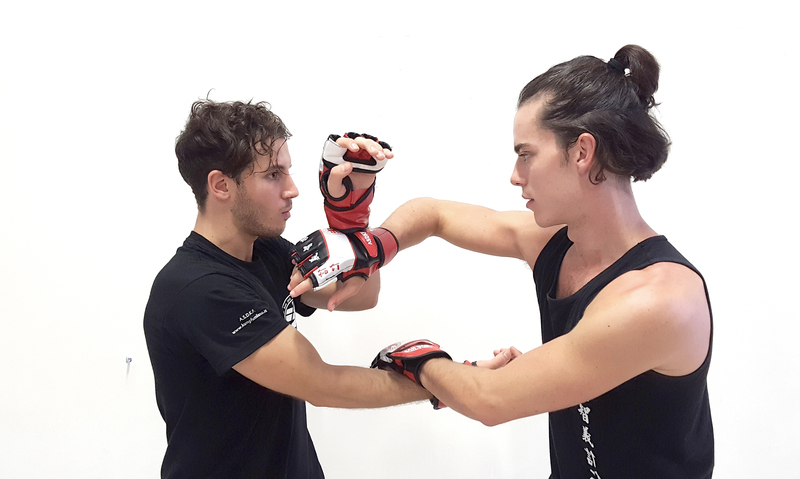 CHI SAO: This excercise is aimed to develop an enhanced sensitivity in order to deflect and discharge the opponent’s strenght. TIMING AND DISTANCE: Study focussed on the learning of different distances and intervention timings towards the opponent. SPARRING: Training devised to freely express all the concepts learnt in the previous sectors. A constant attention on the three essential timings of fighting advance, await and delay, make the study of this discipline refined and engaging. TEACHERS COURSE: Dedicated to who want to face the martial – arts teaching world, learning all the necessary notions to manage groups of kids and adults and to create engaging didactic methods in order to always work in a serene and safe environment. (Course open to learners with a set practice standard). INDIVIDUAL LESSONS: For who want to follow a more specific and tailored training with fixable dates and times. A method that reflects in every-day life by improving the posture and perception of the body, enhancing one’s own level of confidence.